Family Concert Series presents Opera for Kids featuring "The Three Little Pigs"
Franklin Performing Arts Company’s annual, free Family Concert Series concludes this season with Opera for Kids, The Three Little Pigs, on Sunday, April 10 at 2 p.m. at THE BLACK BOX, 15 West Central Street, in downtown Franklin. Arranged by John Davies and set to the masterful music of Wolfgang Amadeus Mozart, The Three Little Pigs is an operatic adaptation of the children’s fairytale classic and brings the beloved story to life. A treasured FPAC tradition for more than two decades, Family Concert Series events are geared toward children in length and format and provide young audiences with a fun introduction to the world of live music. The performances introduce audiences of all ages to music of many genres and feature talented, professional musicians in an engaging, entertaining and interactive way. The Three Little Pigs features Franklin School for the Performing Arts (FSPA) student Madi Asgeirsson and sopranos Shauna Martin and Mariko Matsumura as the three little pigs, along with lyric baritone Thomas Gareau as the wolf. Pianist Synthia Sture will accompany the vocalists. FPAC’s 2016 Family Concert Series is sponsored by Berry Insurance. For more information, call (508) 528-3370 or visit www.FPAConline.com and www.THEBLACKBOXonline.com. The Franklin School for the Performing Arts (FSPA) Ballet Conservatory presents three short ballets, Class Concert, Graduation Ball and Western Revelries, on Saturday, April 2, at 2:00 and 6:00 p.m. at THE BLACK BOX, 15 West Central Street, in downtown Franklin. The production features some 50 area dancers from FSPA’s Ballet Conservatory Division. The program, a mixed bill of distinct repertoire, highlights the dancers’ versatility and provides students with the opportunity to explore different facets of their technique. Originally choreographed in the 1960s for the Bolshoi Ballet School, Class Concert follows the structure of a ballet class. FSPA Ballet Mistress Cheryl Madeux has taken the framework of this piece and restaged it for the FSPA dancers. Her choreography provides an opportunity to demonstrate the serious caliber of FSPA’s Ballet Conservatory training and to showcase dancers’ technique and precision. The ballet’s opening features younger students, and sections of the ballet progress in difficulty to show dancers’ development. Graduation Ball, with original choreography by David Lichine, has been restaged for this FSPA production by Clyde Nantais and Madeux. Set at a fashionable Viennese finishing school for girls, with military academy cadets as guests of the party, Graduation Ball is a comedic, exuberant ballet. Choreographed to the music of Johann Strauss II, the ballet presents a wonderful variety of dances, and entertains with a delightful array of characters and lighthearted comedy. Guest performer Benjamin Kuefler, from Acton School of Ballet, will dance Graduation Ball’s Sylph pas de deux with FSPA’s Noura Sander, 15, of North Easton. Nantais will perform the part of the Headmistress (a character role often performed by a man “en travestie”), with Cassie Murdock as the General. The Ballet Conservatory Division at FSPA provides training in classical ballet technique, pre-pointe, pointe, modern and character dance. The curriculum is based on the foundations of the Vaganova syllabus and incorporates the American Ballet Theatre (ABT) National Training curriculum. For more information about the FSPA Ballet Conservatory program, call (508) 528-8668. To purchase tickets ($18 for adults and $15 for students/seniors) to the ballet production, visit www.FSPAonline.com. Thanks for joining the new Circle of Friends Coffeehouse list. "Guy...has practically invented a finger-picked guitar style, closer to jazz piano than guitar. Billy Novick, on clarinet, had he lived in the 30's would be a legend...."
Billy Novick and Guy Van Duser perform at the Circle of Friends Coffeehouse on Saturday, April 9th. "Elegant." "Riveting." "Soulful." "Classic mastery." These are a few of the terms that have been used to describe the unique and stunning swing-jazz music of acoustic guitarist Guy Van Duser and clarinetist Billy Novick. This concert is part of Guy and Billy's "I Can't Believe We've Survived" tour celebrating 40 years of performing together! They have performed in concerts, clubs and festivals all over North America and Europe. You also may have heard them as frequent guests of the Prairie Home Companion show, NPR's All Things Considered, or on one of the numerous film and television soundtracks they have been featured on. Their music combines two perfectly suited musical personalities. It is based around Guy's innovative finger-style guitar wizardry, and his uncanny ability to play bass lines, chords and melodies all at the same time. With his daring imagination, breathtaking technique, and his wonderful musicality, Guy has become an inspiration for guitarists all over the world. 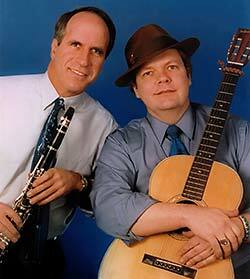 Novick's ever-inventive and soulful clarinet playing provides the ideal complement to Guy's guitar. With his vast knowledge of the classic jazz era, his dazzling improvising skills, and his entertaining vocals, Novick is able to both add a melodic and dynamic spark to Guy's guitar . 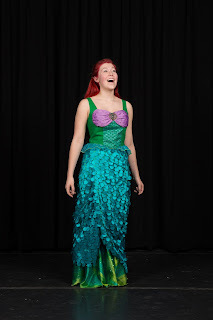 Franklin Performing Arts Company (FPAC) presents the under-the-sea spectacular, Disney’s The Little Mermaid, on March 12, 13, 19 and 20 at THE BLACK BOX, 15 West Central Street, in downtown Franklin. Be a VIP Under the Sea following the March 13th matinee performance with a package experience that includes an exclusive reception featuring a photo opportunity with Ariel and her friends. Under the direction of Nick Paone and Raye Lynn Mercer, FPAC’s production of the family favorite musical imaginatively uses THE BLACK BOX’s flexible space. The intimacy of the venue and the show’s clever staging bring audiences right up close to all the action and into The Little Mermaid’s fantasy world. The theater’s 360-degree catwalk provides a dramatic platform to feature the production’s professional orchestra, conducted by Musical Director Hallie Wetzell. FPAC’s costumer, Merrie Whitney, who is building the entire show, has fashioned designs that are true to the spirit of the movie, but reflect her creativity in supporting the show’s direction and choreography by Paone, Mercer and Kellie Stamp. Sea creatures are anthropomorphized and given human qualities to bring the underwater scenes to life. Spotlighting the talents of more than 40 area performers, FPAC’s production of Disney’s The Little Mermaid is presented as part of the company’s 25th anniversary season. Performances are on March 12 and 19 at 2:00 and 7:30 p.m., with Sunday matinees at 2 p.m. on March 13 and 20. For tickets and more information, visit www.THEBLACKBOXonline.com or call (508) 528-3370. Disney’s The Little Mermaid is presented through special arrangement with Music Theatre International (MTI).